This beautiful deluxe edition of A Gift of Prayers fills that need gloriously. Foil-stamped title on deeply textured cover paper on the outside, with blue lettering on elegant cream-colored paper inside, this prayerbook is “perfect bound” with a square spine that has the title printed on it so you can find it on a bookshelf. Our pocket edition of A Gift of Prayers (BKT-BP) is our best-selling product, but many seekers and friends of the Faith deserve something more than a pamphlet-style prayer book. They need a prayer book that looks like a book, and yet they might not be ready for a 345 page standard prayer book. This beautiful deluxe edition of A Gift of Prayers fills that need gloriously. Foil-stamped title on deeply textured cover paper on the outside, with blue lettering on elegant cream-colored paper inside, this prayerbook is “perfect bound” with a square spine that has the title printed on it so you can find it on a bookshelf. Its beauty and format inspire the reverence of a full-sized prayerbook. It comes in an assortment of covers to suit your style. Inside it has the same well-organized collection of seeker-friendly prayers that has made this our best-selling product, with over 300,000 in print! Large type with new, elegant first-letters and calligraphic ornaments make these prayers as visually beautiful as they are spiritually uplifting. By the way, did I mention that these are BAHA’I prayers and writings? You know, the kind that set your spirit singing and soothe your worried mind? In these troubled times, almost everyone is receptive to Baha’i Prayers. People who haven’t said a prayer in years will take this home and put it beside their bed – just in case. There are 116 selections, and every single one of them has the power to transform a life. 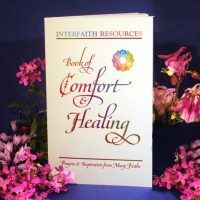 This little booklet holds enough spiritual guidance to meet the needs and attract hearts of anyone willing to read it, yet it is small enough to slip in a purse or coat pocket. There is a brief introduction, full table of contents with first lines and a cross index. There is Bahá’í contact information on the last page but no advertising anywhere. Best of all, it is still priced to be given away by the handful, with a case price of less than $1.50 each. We also have a Large Print Deluxe edition for older and younger readers. NOTE: I can fit about 190 regular mini-books or 120 of these thicker Deluxe prayer books in a large flat-rate box for low-cost international or domestic shipping.